Every year on Flag Day, many cities all over the United States hold events to celebrate the good old stars and stripes. They include colorful parade floats, live music, ceremonies, and singing of the national anthem. Some of these celebrations are recently established and other parades have been a tradition for generations. One of the oldest of these celebrations is the parade in Fairfield, Washington, which has been going on every year since 1910, with the possible exception of 1918. The Flag Day parade in Quincy, Massachusetts celebrated its 59th year in 2010. The largest Flag Day parade in the country is in Troy, New York. Over 50,000 people come out every year to join in the festivities. Each of the colors on the flag has their own meaning. Red stands for courage, blue means vigilance and justice, and white represents purity and innocence. The number thirteen represents the thirteen American colonies that once rallied around the new flag as they fought against the British for self-governance. There are certain rules of etiquette for displaying the flag. It must never be allowed to touch the ground and if it is displayed at night it must be illuminated. There are 6 American flags planted on the moon. 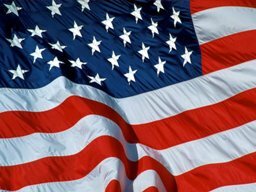 This Flag Day, show your patriotic pride and fly your American flag at home!